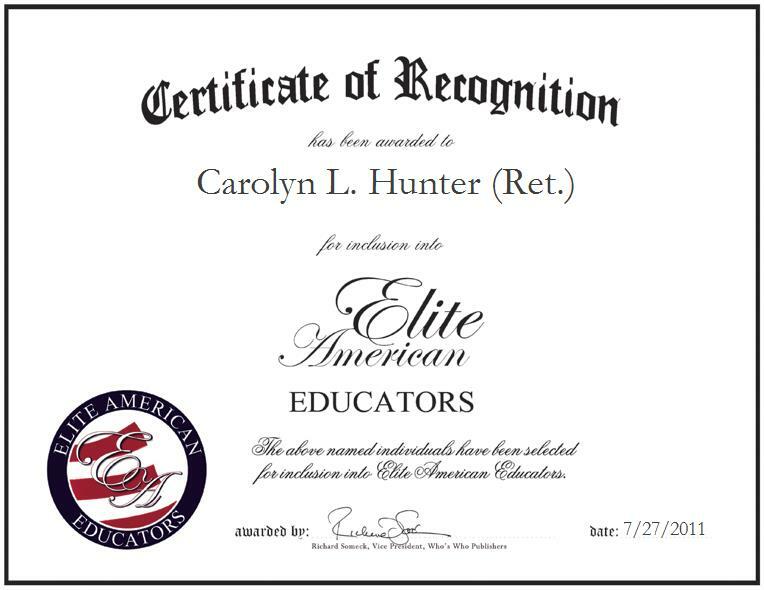 Millington, TN, Carolyn Hunter, Retired Second-Grade Teacher for Shelby County Schools, has been recognized by Elite American for dedication, achievements and leadership in elementary education. Looking back on her 39-year career in elementary education, Ms. Hunter attributes her success to her passion for educating children, commitment to adapting her teaching style and maintaining an open mind. She began her journey as an educator in 1971 at EduCare Childcare Center as an assistant teacher and kindergarten teacher. In these positions, she developed her desire to inspire children to become enthusiastic about education, which invigorated her to return to school. In 1983, Ms. Hunter completed a Bachelor of Science in education at the University of Memphis following her receipt of a Bachelor of Arts in history from the same institution. She also obtained a position with Shelby County Schools as a kindergarten teacher that same year. Wanting to continue her education still, she returned to the University of Memphis to earn a Master of Education in 1987. Toward the end of her career, Ms. Hunter transitioned to teaching second-grade students at E.A. Harrold Elementary School. During her tenure at the school, she achieved 18 consecutive years of perfect attendance, a remarkable feat as an educator. She also received the 2005 Teacher of the Year Award in recognition of her devotion and loyalty to her students and the profession. Ms. Hunter maintains her affiliations with The University of Memphis Alumni Association, the National Education Association and Kappa Delta Pi. She is also an ardent supporter of St. Jude Children’s Research Hospital, Disabled American Veterans, the American Cancer Society and the Arthritis Foundation. Now retired, she enjoys spending her time reading, crocheting and gardening.